The modern-day editor is no longer just an editor. You organize, you edit, you color, you format, and often you edit and mix your own sound as well. This might mean bumping up the levels to make everything audible (sometimes using the ‘duplicate-the-audio-file’ trick), throwing in a couple sound effects, or even going as far as automating the volume levels and trying to meet certain audio level standards. While NLEs like Premiere Pro or Media Composer don’t exactly set you up for audio success like a professional DAW (digital audio workstation) would, the tools provided out-of-the-box are actually quite capable if you know how to go about using them. We’d like to help demystify common audio tools for the video editor, and how to better utilize them. For now, we’ll start with a powerful one: Compression. Compression is simply a method of reducing the difference between the quietest and loudest parts of your audio, which is usually used to make the overall volume more consistent. The overall volume of your videos are low. Your audio tracks are loud in some spots and soft in other spots. Your audio tracks keep clipping (even if the original audio isn’t clipped). You have to spend a ton of time automating the music to go under the voice-over or dialogue. The ‘S’ sounds in your recordings stick out in a noticeable and irritating way. 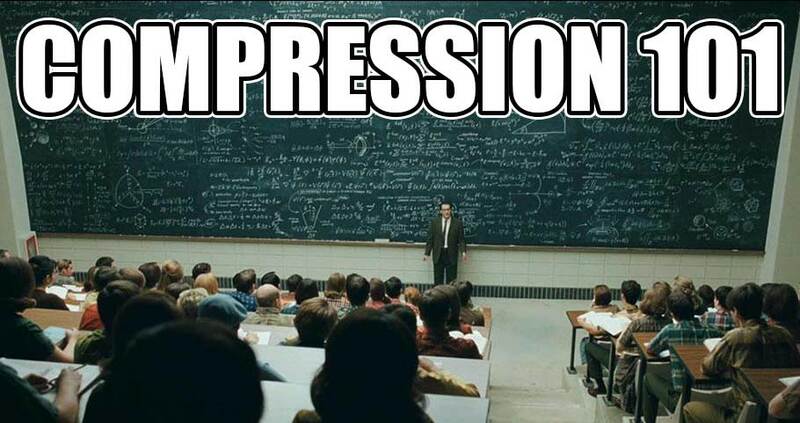 Now let’s understand what some of the basic compression controls are actually doing. 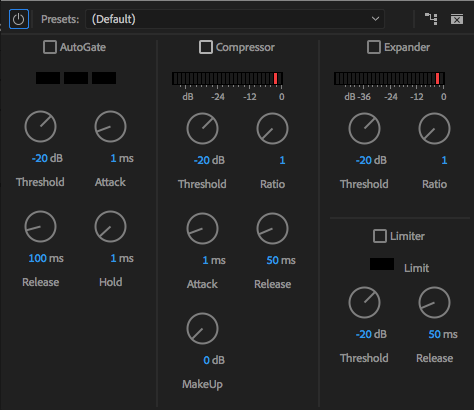 These are the most common basic controls of every dynamics processor (Compressor, Limiter, Maximizer, DeEsser, etc). Keep in mind that some plugin manufacturers may use different terminology to refer to these controls. This determines how much you want to reduce the volume. It’s given in a ratio like 1:1, 4:1, 10:1, etc. What this actually says is: “for every deciBel over the threshold, I want to reduce the sound by X deciBels”. So really, every ratio is X:1. The sound over the threshold will be X times quieter. The threshold is the sound level at which you want to begin reducing loudness. For instance, If most of your audio clip stays around -20dB, but there are some loud parts that reach into the -12dB range, you could place your threshold somewhere between -20dB and -12dB. 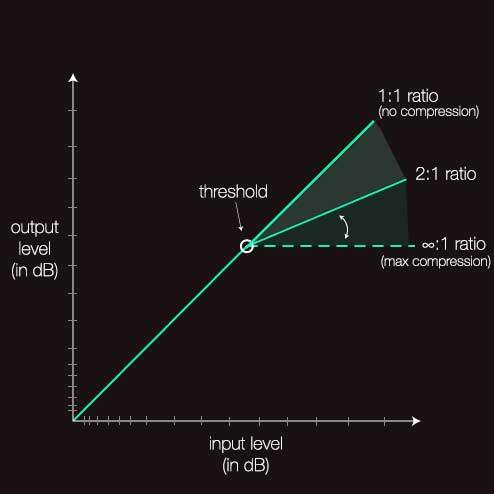 Between ratio and threshold, you hold the core essentials of audio compression. These determine how quickly the compressor turns on when audio reaches the threshold (attack) and how quickly the compressor turns off after it dips below the threshold again (release). These controls are often the most difficult to understand, even for experienced audio engineers. They can be difficult to hear without a trained ear. You may consider looking at presets provided in the tool as a starting point. In the digital world, a gain control is just like an additional volume control (gain is actually different from volume/level in the analog world). It’s important to have at least one gain control on a compressor, though, sometimes you’ll find two. One for the signal coming in, and one for the signal coming out. Input Gain: Use this when your signal is too soft to start with. It’s best to have your audio levels at optimal levels before applying further processing. Output Gain (Makeup Gain): Use this to make up for the volume you’ve lost during compression. Keep in mind, most often, you’ll compress not to make something quieter, but to make more consistent levels. So once you reduce volume with compression, you reamplify it to bring it up to where you want it. If your compressor doesn’t have this control, it’s likely that it’s automatically making up the gain to lessen your workload. Here are a few ways you as a video professional, might be able to use compression in your workflow. For this tutorial, we will be using Premiere Pro, its Track Mixer function, and its included track effects. Media Composer and DaVinci also have track functionality, but FCPX does not and will require compression to be added to each individual clip. Remove any duplicate audio clips/regions (some editor’s duplicate their audio files to increase the volume, but with compression and other track effects, this is unnecessary). Make sure all clips on a track are related (VO, dialogue, sound effects, music, etc). Start off without any volume automation. Compression usually happens first in a chain of audio processing events, so to make things easier, save your automation for afterward. Label your tracks. You don’t have to, but it will make life easier for you. Mostly, you’ll be concerned with the center section, labeled Compressor. It has the 5 basic controls that we just went over. Start by setting the threshold to about the level you’d like to start limiting your VO. The default might be a good place to start of -20dB, but it depends on your recording. 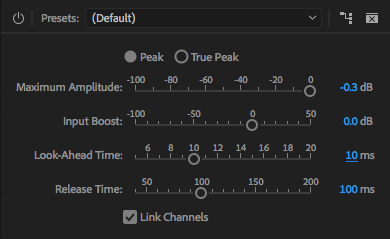 Remember, if your VO is too soft coming into the compressor, you may want to give it some extra gain ahead of time (above the Dynamics effect in the effects chain) using the Amplify effect. After setting a rough threshold, apply your ratio. Anywhere from 2:1 to 4:1 is a decent ratio to keep a natural sounding VO. If you are going for more of a compressed radio or commercial sound, you can push this further to 5:1 or even 8:1 in extreme situations. You will need to play with these. Consider your vocal performance. Do they come in quick and strong after a pause? Or are they softer spoken and ramp up their volume slower? Listening to the performance will help you know how to set your Attack/Release. As a cool tip, try starting off by using an extreme ratio/threshold settings. The Attack and Release settings of the compressor will be much more pronounced and may be easier for you to tune. Then bring your ratio/threshold back to a reasonable setting. In addition to using the compressor, you might consider using the AutoGate feature to completely dip out the audio in between phrases or sentences. The controls work the same as with a compressor, but instead of compressing, it ducks the audio out completely. This might help clean up your sound if you have some excess noise you can’t clean out. NOTE: With the addition of Adobe’s Sound Essentials panel, you have access to quick compression controls called Loudness and Clarity. You can play with these to achieve a similar effect, but if you need more control, use the Dynamics tool shown above. You might also consider the Repair tools as quick foxes for slight noise problems. While many compressors have a function for sidechaining to allow you to automatically duck the levels of one track in response to another, Premiere Pro’s tools do not. 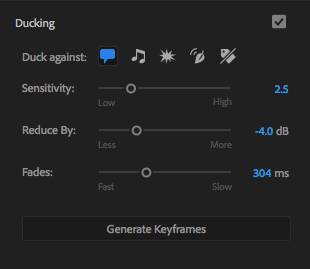 Instead, in the newest release of Premiere (12.1), they have included a tool called Ducking in their Sound Essentials panel in the music role. This is not traditional ducking, as it is actually just automatically automating the levels on the track based on your parameters. However, this is still a huge time saver for many editors, so take advantage of it. Dialing in the exact settings will take some trial and error. Try starting off by only reducing gain by 3-4dB. Keep in mind also that your release time should be longer than your dialogue’s duration of frequent pauses so that the music doesn’t ride back up every time they stop to take a breath. If your voice recording has very harsh ‘S’ sounds that seem to pierce in an unpleasant way, there exists a tool called a DeEsser that is a simple compressor that acts only on a specific band of frequencies. When you add a DeEsser to your track, simply change the center frequency control until you are compressing the ‘S’ sounds in your recording (this must be tuned as everyone speaks differently, with noisier or piercing ‘S’ sounds). Once you have that dialed in, try reducing the bandwidth (compressing extra frequencies you don’t need to is something to avoid). If the voice is starting to sound like it has a lisp, this is a tell-tale sign that you are compressing it too much. Try lifting the threshold. Take a look at the gain reduction meter on the right. It’s a general best practice to not exceed 4-6dB of compression, as going more than this will start to sound unnatural. However, this is just a guideline. Note: Premiere Pro now includes a DeEss function in their Sound Essentials panel once you’ve assigned your audio a role of Dialogue. You can use this, but it is a simple on fader control, so if you need finite control, use the methods above. Throwing a limiter on your tracks is a great way to help prevent clipping. The goal of this type of compression is not to make anything louder, but just to stop the loudest parts from exceeding what the computer can handle. Limiters are basically high ratio compressors (10:1 or higher) with a fast attack. As a finishing move for something like a TV commercial, you might want to apply an overall compression on the master channel. Typically, an audio engineer might use a combination of a multi-band compressor and a maximizer, but we’ll just focus on the latter. Maximizers will function as both a limiter (prevent sound from reaching past a certain threshold) and a magic “make-it-louder” tool. 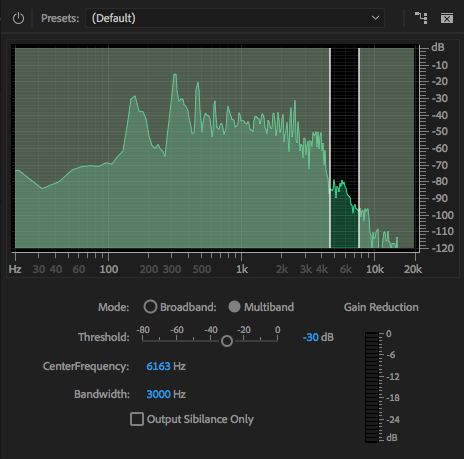 Premiere has a maximizer inside of their Mastering tool. Make sure to turn down all the settings except for the maximizer, as the default settings will add reverb and high-end frequencies to your mix and it will not sound very good. Remember, a small amount of maximization goes a long way. Even the default of 20% might be too much for your mix. Play with it, listen, walk away and come back and listen. If it sounds too compressed, pull it back. The goal is to gently glue your entire mix together and bring the volumes to a consistent, deliverable level. Hopefully, you’ve been able to take away at least one new technique to improve the audio in your videos. Compression is something that takes a while to master, but even a little bit can go a long way when you don’t have an audio engineer available to help you out. Be sure to check out our other articles: Editor’s Guide to Audio: Convolution Reverb and 7 Tips for Video Editors Doing Their Own Sound.